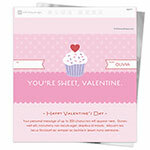 Celebrate Valentine's day in sweet style with this darling cupcake wrapper. Design: Cupcake topped with a heart and sprinkles and polka dot background. 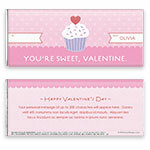 Personalization: To and from flags, front message, back title and message.